Oops - we don't appear to have a video for the DR-G2110. The imageFORMULA DR-G2 series of scanners are designed to handle high daily volumes while upholding scan clarity and quality, and operate at high-speeds to digitise hard copies and maximise office productivity. All three scanners benefit from a quick start-up time and can reliably scan upwards of 180 images per minute, with the DR-G2110 capable of scanning 220 images and the DR-G2140 280 images per minute. Users can handle volumes of up to 30,000 scans in a single day while batch processing multiple mixed documents simultaneously through the Active Threshold function. The DR-G2110 and DR-G2140 scanners make light work of demanding workloads by producing up to 50,000 and 70,000 scans each day respectively. Scanning documents to a superior image quality for accurate digital data extraction can be relied upon, including barcode and 2D code recognition. Wrinkled documents and light-coloured text can easily be sidestepped by the Active Thresholding feature. Faint text and patterned background documents can be scanned and processed without the need to change settings, and advanced image processing automatically adjusts image brightness to render crisp, clear scans. The scanner also comes with CaptureOnTouch Pro software which has many powerful intelligent features yet offers a very user friendly easy operation, requiring very little knowledge to get started. Made from highly durable material, the imageFORMULA DRG2 series is built to shoulder a heavy workload all day, every day. User-friendly design ensures media and documents fed through the 500-sheet capacity automatic feeder is safely returned through the U-turn paper path for excellent results every time. A robust paper feed system and efficient transport rollers handle a wide variety of document sizes and thicknesses, from business cards to A1- documents, thanks to the Folio Mode feature. 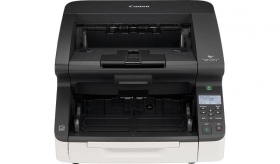 For offices and users aiming to scan documents over a network without the need to connect to a PC, the DR-G2110 and DR-G2140 scanners connect to the network over a wired LAN connection for maximum efficiency.